Macphun teamed up with famed photographer and HDR specialist Trey Ratcliff to attempt to demystify HDR editing. Your eyes can see a lot more than your camera sensor can, and high-dynamic range photography, or HDR, is a popular technique that attempts to overcome those limitations by bringing out detail in both the light and dark areas of a photo. HDR is especially popular for travel photos, like landscapes, but getting it right can take careful shooting and skillful editing. 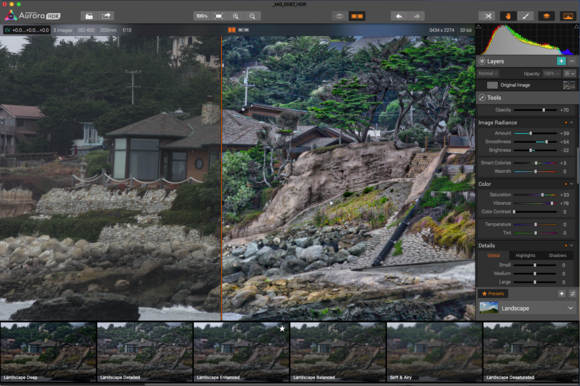 To help photographers of all skill levels achieve flexible HDR results, Macphun tapped HDR photographer and Stuck In Customs founder Trey Ratcliff to co-develop a new app called Aurora HDR. “It was as tight a collaboration as we can have short of his putting fingers on the keyboard,” Kevin LaRue, Macphun’s vice president told Macworld. “Trey has been involved with the naming conventions, the workflow, and the order of tools on the right-hand side of the interface.” In addition, the software will sport signature custom presets and textures straight out of Ratcliff’s shop. Macworld got a sneak peek at a prerelease version, and found Aurora HDR very easy to use, instantly familiar if you’ve used Macphun’s previous Mac apps like Noiseless, Intensify, and Focus 2. Choose from categories of presets or create your own. The app’s algorithms support a spectrum of HDR looks, from natural to stylized, and employ layers, masking, and brushes for selective edits, radiance controls, custom textures, detail enhancements, color and toning, and controls for vibrant color-tone combinations. Presets are grouped into categories: Basic, Architecture, Landscape, Indoor, and Dramatic. You can group your own favorites together and customize and save original presets. Despite the descriptive names, the preset categories aren’t always as targeted as you’d expect, so you will likely wind out testing several to find the effect that best fits your image. Use the previews to decide on the best preset. While you can click on each preset to see how it will affect your image—there’s no lag time in performance—the dynamic preview at the bottom of the window gives you a good idea of whether a selection will give your picture the boost you’re looking for. 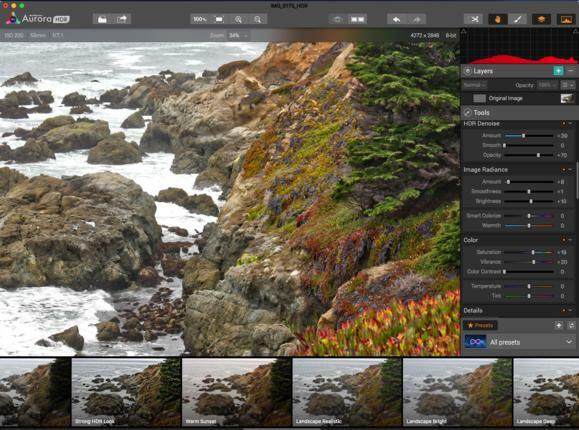 The heart of the app lies with its manual toolbox, which contains controls for Raw images, tone mapping, tone structure, noise, radiance, color, details, glow, top & bottom lighting, tone curve, color filter, color toning, and vignette. With all those adjustable controls to keep track of, it’s no wonder users go straight to the presets. But each preset can also be adjusted with these same manual control sliders. 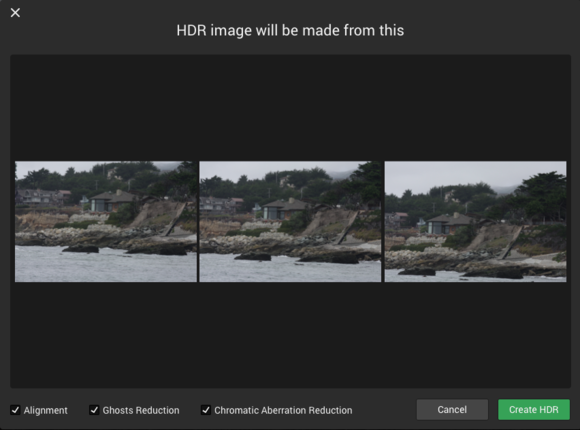 Import bracketed shots into Aurora HDR as a group. 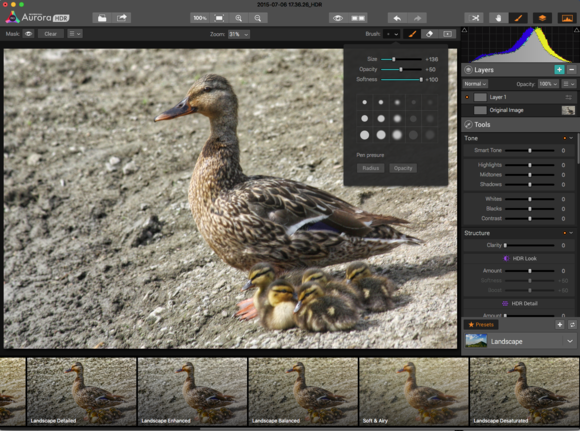 If you took the same shot in multiple exposures—a common technique for HDR, called bracketing—you can load your bracketed shots into Aurora HDR, and the app will combine them into a single image. You can choose to have the app automatically correct alignment, ghosting, and chromatic aberration. Even if your shots aren’t bracketed perfectly, Aurora will still give you something to work with. The layers feature facilitates compositing as well, so you can actually load in a second image or texture and adjust the opacity for a unique look. The app supports popular image formats including RAW, JPEG, and TIFF. Use brushes to paint effects on your image. Built-in sharing supports popular photo communities like Flickr and Smugmug, while the sharing panel contains an export function to popular editing packages like Apple Photos, Adobe Photoshop and Lightroom, Aperture and more. Macphun is taking preorders starting Monday for Aurora HDR’s release on November 19. The standard version will be $40 at first in the Mac App Store, later going to the regular price of $50. 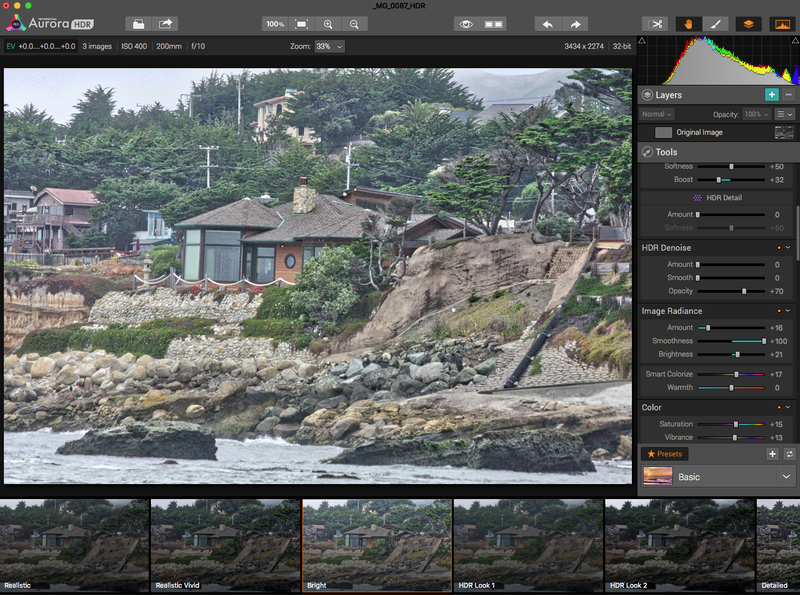 Aurora HDR Pro will have an introductory price of $80 from Macphun or Trey Ratcliff’s site, and a regular price of $90, with a free trial available. The app will also be available as a plugin for Adobe Photoshop and Apple Photos.